The Two Year Yoga Teacher Training program offers a comprehensive study of the sacred subject of yoga. It provides the groundwork to become a Certified Iyengar Yoga Teacher, CIYT, as well as offering an "in-depth" study for sincere students. This teacher training program is designed for participants to experience a steady transformation. Affirming a Foundation of Yoga in Your Life: A yoga practice provides the source from where the teaching streams. Daily practice sessions are assigned to guide the trainee in proficiency in the practice of asana and pranayama. Study Approach for Teaching Asana and Pranayama: Indepth study to establish knowledge of asana and pranayama, and to integrate the teachings of the method. 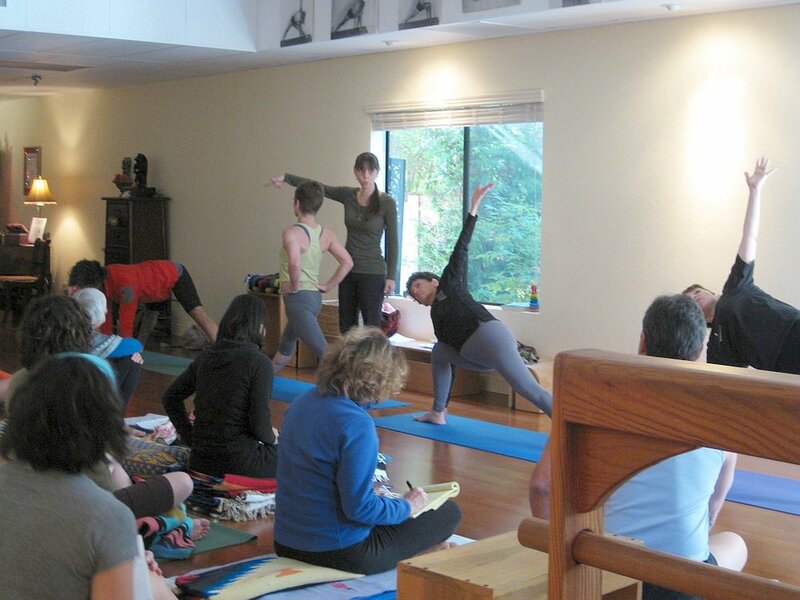 Art of Sequencing: Dynamics of vinyasa and building sequences for practice and teaching. Teaching Practicum: Exercises in the art of teaching yoga are performed to acquire teaching skills. Emphasis is given to develop the art of observation while teaching. Modifications, Corrections, and Adjustments: Props are an act of compassion to transform practice. Learn the correct use of props, how to carry through with corrections, make adjustments, and apply modifications of asana. Mentorship/Apprenticeship: Personal guidance meeting each individual’s needs is provided to keep one steady on the path. Anatomy and Physiology: Eastern and Western concepts of the major body systems as well as how they pertain to yoga. Philosophy: The living philosophy of yoga is to be experienced. A firm foundation in the understanding of the School of Philosophy of Yoga is offered. Well Being: Living the life of a yoga practitioner and teacher. Ethics, Ayurvedic and Yogic principles for health and well being. Three or more years of continuous study of Iyengar Yoga with a Certified Iyengar Yoga Teacher, CIYT. Dedication to studying the Iyengar Yoga Method. Commitment to a home practice. Membership in an Iyengar Yoga Association. Seven weekends and one week-long session at the Center. For those living out-of-state, live streaming, interactive classes will be available for some sessions with permission. Iyengar Yoga Encinitas is a state-of-the art yoga facility, fully equipped with props as designed by B.K.S. Iyengar. Just a couple of miles from the Pacific Ocean, it offers a serene meditative environment facilitating yoga teacher training. Submit completed application by September 1st of each year. Acceptance into the yoga teacher training program is based on an interview and practice audition as well as application review. Start date is in the Fall. $2500/year, due by the first meeting in October. Installments allowed upon agreement. Scholarship upon availability and approval. $50 application processing fee must accompany yoga teacher training application. Mentor Teacher/Director A leader in the community, Carolyn Belko has been training teachers throughout the west since 1997. Director of the Iyengar Yoga Center Encinitas, CA, Carolyn is one of few to offer weekly Yoga Therapeutic Classes and Training since 2000. Carolyn has been to India to study with the Iyengar Family numerous times and was blessed by receiving Senior Level III Certification from B.K.S. Iyengar in 2010. She serves as an assessor for IYNAUS. Carolyn’s insight in the practice and the art of teaching offers one devoted and steady guidance along the path of yoga.